TonerGreen Eco-Friendly HP 128A (CE320A, CE321A, CE322A, CE323A) Set of Toner Cartridges | TonerGreen - Eco-Friendly Toners from the U.S.
TonerGreen is an online provider of eco-friendly toner cartridges and eco-friendly ink cartridges for major printer manufacturers such as Hewlett-Packard. We offer a wide selection of eco-friendly remanufactured HP toner cartridges are expertly built by our professional technicians to make sure that they can meet the standards set by the printing industry. One of TonerGreen best-selling eco-friendly HP toner cartridges is the Eco-Friendly HP 128A (CE320A, CE321A, CE322A, CE323A) Set of Toner Cartridges ($99.99).Our HP CB320A, CB321A, CB322A, CB323A Set A Toner Cartridge Set is Eco-Friendly! Remanufactured with up to 75% recycled components, our HP CB320A, CB321A, CB322A, CB323A Set A Toner Cartridge Set is thoroughly engineered to meet or exceed OEM specifications. 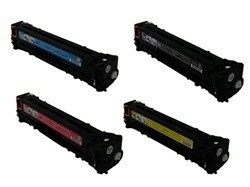 All our ink and toner cartridges are backed by 100% Risk-Free Guarantee. Experience ultimate Eco-Value when you purchase our remanufactured HP CB320A, CB321A, CB322A, CB323A Set A Toner Cartridge Set: practical environmental solution, world-class service, and the highest quality Toner Cartridge Set at the most competitive price.